Calamity is a Chicago-based, award-winning, Kilroys-cited playwright. In 2018 Calamity had two world-premieres including IN THE CANYON at Jackalope Theatre Company and HINTER at Steep Theatre Company. In January 2018 her play ENGINES AND INSTRUMENTS OF FLIGHT: A FANTASIA IN THREE ACTS, originally commissioned at The Goodman Theatre, had its first New York reading at The Roundabout. Another of her plays, GREETINGS FROM MOSCOW! A LOVE STORY, is currently in development at TimeLine Theatre Company’s Playwrights Collective. Additional plays by Calamity West include: GIVE IT ALL BACK (2016, Kilroy-cited); ROLLING (2016); IBSEN IS DEAD (2014); THE PEACOCK (2013, Kilroys honorable mention); THE GACY PLAY (2012); and COMMON HATRED (2012). In 2014 Calamity was recipient of the 3Arts Award. She teaches playwriting at the University of Chicago and Webster University. She is a company member of Jackalope Theatre and an artistic associate of Sideshow Theatre Company. 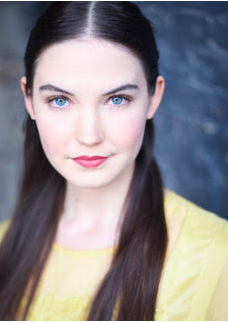 Katherine is an actor, producer and teaching artist living in Chicago. Recent credits include work with Red Theatre Company, The House Theater of Chicago, Route 66 Theatre, Raven Theatre, The Gift Theatre, and A Crew of Patches. She is on staff as an instructor with Black Box Acting. Before moving to Chicago, she spent seven years in Dallas, TX, where she was a cofounder and producer of Shakespeare in the Bar and TRIBE, for which she was named a 2016 Dallas Mastermind and awarded a Best of Big D win. She worked as an actor across the DFW metroplex, and is an ensemble member at Undermain Theatre. You can hear her voice through many anime characters (Overlord, Dance With Devils, etc) with Funimation Studios. Most recently, she filmed a role in the pilot of a series for HBO to be released in 2019, and helped to produce the upcoming film, Eat Your Heart Out. Katherine-Bourne.com. Mary is an actor and comedian based in Chicago, Illinois. Recent credits include The Wolves (Goodman Theatre), Hookman (Steep Theatre), The Arrow (Neo-Futurists Theatre). She improvises at iO Chicago where she has a weekly show with her team Devil's Daughter. She is a proud company member and teaching artist with Barrel of Monkeys. Mary's recent film projects include the short films Chat Room (screened at Chicago Shortcut 100 International Film Festival) Moira Angela Darling (winner of SC Indie Grits Festival Young Grit Award) and Bookmarked (Assistant Director, Producer) as well as several collaborations as a writer and actor in comedy shorts with the iO Chicago Comedy network. Jason is a DP currently residing in Chicago, IL. He most recently filmed the first season to a new Adult Swim series called "Joe Pera Talks with You". It released in Spring 2018 to critical acclaim. The LA Times "found art in the 11-minute episodes", Polygon called it "Adult Swim's best new show" and mentioned "each episode is shot beautifully", and Indiewire says it'll "make you happy to be alive". In addition, Jason has extensive DP experience on commercial and feature film projects. He shot Stephen Cone's "Henry Gamble's Birthday Party" which screened at the BAMCinemaFest, Maryland International Film Festival and the Chicago International Film Festival. He has DPed commercial projects for brands like Nissan, Samsung, Blue Cross Blue Shield, Feeding America, and Everytown for Gun Safety. As one who strives to weave together all parts of a story to create a coherent picture, Lindsay Rynne’s passion for editing dwells in these attempts to make meaningful connections in film. Her passion for making films was noticed early on by her high school teachers, and ever since then she has dedicated her life to helping others connect the dots in their stories. Following this path has led her to work for some of the most respected brands such as Nike, GrubHub, Jim Beam and on behalf of well-known Chicago agencies: Walton Isaacson, We Are Unlimited, and BBDO. Lindsay won AICE's Social Media Campaign in 2018 for her work on Nike+Chicago's "The Force Is Female" campaign. These experiences catapulted Lindsay into another dimension of filmmaking. Building upon the commercial work, she has enjoyed expanding her portfolio to include a wide array of mediums such as music videos, documentary-short form, narrative-short form, episodic web videos, experimental, and branded content. This diverse portfolio is built on Lindsay’s personable charm and keen attention to detail, qualities that are sure to make your next project succeed and speak to those who have yet to hear. Dana Macel is a props designer, scenic designer, and actor in the Chicago theatre scene. She graduated from Loyola with a degree in Theatre and a degree in Film and Digital Media production, but this is the first film project she has exclusively designed for. Dana is currently working with Dani and Calamity as the props designer for In the Canyon, opening at Jackalope Theatre this October. She is thrilled to be joining forces with them again on this exciting film! Travis Delgado is happy to have worked with the cast and crew of “Cool For Five Seconds". Travis graduated from Texas A&M University at Corpus Christi and now lives in Edgewater, Chicago. He is best known for playing Jurgis in Oracle Productions' "The Jungle" as well as The Foundling Father in "The America Play", which received a Jeff Nomination. He was also in the ensemble of Mary Zimmerman's World Premiere adaptation of "Treasure Island" at the Lookingglass Theatre. He’s done features for Chicago PD and Fire on NBC and is currently in a feature film called Two In The Bush at multiple film festivals in and out of the U.S. Travis would like to thank his mother, father, and brothers for their love and support.